Would you believe that The Grapes of Wrath was an influence on the writing of The Martian Chronicles? Well, it’s true. When asked what author most influenced him, Ray Bradbury said Steinbeck. 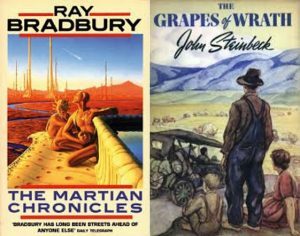 More specifically, Bradbury noted that he used The Grapes of Wrath as a model for The Martian Chronicles. Steinbeck used a series of field reports from Farm Security Administration worker Sanora Babb describing the lives of the displaced migrants moving to California in 1938. He personalized the characters in the great migration and wove these desperate individual stories into the personal tale the novel b ecame. Similarly, Bradbury took a number of his short stories and linked them in an episodic tale, relocated on Mars. So, is this an approach any writer can take? 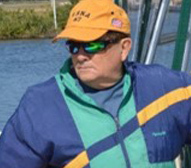 Last year in a workshop given by NYT Bestselling author, Bob Mayer, our group discussed this very thing. Our conclusion was the answer to this question is yes. Methods, ideas, and frameworks are all fair game assuming that you don’t actually copy a work word for word. Sometimes, things get pretty close. I’m fond of the books written by Raymond L. Weil, especially the Moon Wreck series. In the first book copyrighted in 2013, Moon Wreck, Jason Strong and his best friend Greg Johnson crashed their lander on the moon. They tried to fix it but couldn’t. So, they followed a strange radio signal coming from the moon and discovered a large crashed space ship, not from Earth. Good start to the story, right? Clever, right? Imagine my surprise a year later when I started reading the Perry Rhodan series, starting of course with number 1, Enterprise Stardust. And how does it open? How about Perry Rhodan and his crew have a mishap landing on the moon and follow a signal and find a big crashed space ship, not from Earth. That book was published in Germany in 1961. By the way, the Perry Rhodan series and spin-offs are the bestselling series of all time with over two billion copies sold. The point is that you can find inspiration and ideas from other works to influence yours. For example, for the third in my Galactic Host series, Search for the Host, I used Mark Wayne McGinnis’ Ricket as a model. I screwed up my interpretation the first time, but I think I’ve got it fixed now. So, what ideas for a book do you have, and what might you use as a model? Fahrenheit 451: characters tell the story.